The second Skipjack (SSN-585) was laid down on 29 May 1956 by General Dynamios Corp. Electric Boat Division Groton Conn. launched on 26 May 1958 sponsored by Mrs. George H. Mahon wife of the United States Representative from the 19th District of Texas; and commissioned on 15 April 1959 Comdr. W.W. Behrens Jr. in command. Skipjack was the prototype which mated nuclear power with an Albacore hull. During her shakedown cruise in August 1959 she became the first nuclear ship to pass through the Straits of Gibraltar and op erate in the Mediterranean Sea. 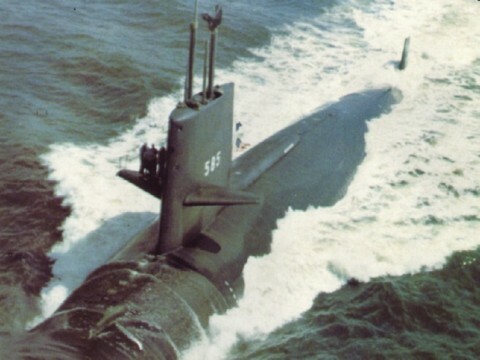 Following post-shake down availability at Groton Conn. the nuclear sub marine conducted type training and participated in an advanced Atlantic submarine exercise from May through July 1960. The remainder of the year was spent in a restricted yard availability and upkeep. Skipjack commenced her 1961 operations by partici pating in two weeks of type training followed by anti submarine warfare exercises through August visiting Mayport Fla. before returning to Groton. In January 1962 Skipjack operated out of Key West Fla. for two weeks before entering Portsmouth (N.H.) Naval Shipyard for extensive overhaul lasting four and one-half months. Following her return to New Lon don Conn. the submarine operated locally prior to de parting in October for duty in the Mediterranean with the 6th Fleet. During this tour Skipjack participated in various fleet and NATO exercises and visited Toulon France; and La Spezia and Naples Italy before re turning to New London. The year 1963 was occupied in submarine attack op erations and ASW exercises all designed to test the capabilities of the nuclear-powered attack submarine. The highlight of 1964 was two months of duty with NATO forces participating in exercises "Master stroke" and "Teamwork" and visiting Le Havre France and Portland England before returning to New Lon don in October. After devoting most of 1965 to training exercises the submarine ended the year by entering Charleston (S.C.) Naval Shipyard for an overhaul that lasted until 18 October 1966. Skipjack then got underway for sea trials off Charleston before joining Shark (SSN-591) for four days of type training in the Jacksonville Fla. area. She then sailed to her new home pork Norfolk Va. before participating in Atlantic Fleet exercises. Early in February 1967 Skipjack got underway for sonar and weapon tests and then participated in At- lantic submarine exercises from March through June. July and August were spent in restricted availability at the Newport News Shipbuilding & Dry Dock Co. following which Skipjack took part in FIXWEX G-67 an exercise designed to evaluate fixed wing ASW air craft against a submarine with Skipjack's characteris tics. Following an extended deployment in October and November the submarine returned to Norfolk to prepare for major operations of that year which she completed on 25 February 1968. The remainder of 1968 was spent in local operations in the Norfolk area. On 9 April 1969 Skipiack commenced an overhaul in the Norfolk Naval Shipyard which was completed in the fall of 1970. After sea trials in December 1970 Skipjack returned to her regular duties. Highlights of 1971 were sound trials and weapons system tests at the Atlantic Fleet Range Puerto Rico from 25 January through 5 March and NATO exer cise "Royal Night" from 15 September to 9 October. On 22 October Skipjack returned to Norfolk where she remained through January 1972. Skipjack spent most of 1972 in tests and type train- ing out of New London and Norfolk and in the Carib- bean. The submarine returned to Norfolk late in the year and remained in the area into 1974.